One wouldn’t think of Pittsfield, Massachusetts as a burgeoning hotbed for film, musicals, and stagebut recently unveiled plans could result in the creation of thousands of theater seats in a slough of venues. Currently only the Berkshire Lyric Theatre and the Berkshire Museum have regularly scheduled programming in the city. Other theaters have been either demolished, leaving vacant lots between buildings, or converted for other use, like senior centers or retail. But right in the center of this struggle arrives an ambitious plan to restore and expand the city’s historic Colonial Theatre, which hasn’t functioned as a theater in over 50 years. The plans for the Colonial come on the heels of funds raised, recruiting support from city officials, and the selection of an architectural firm. 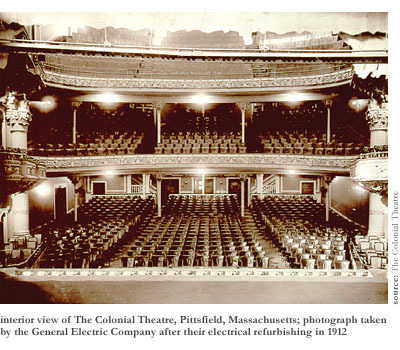 On Wednesday, October 20th at 7 pm, The Colonial Theatre Association held a community meeting in the Pittsfield City Council Chambers to unveil the philosophy and planning behind the renovation of the downtown theater. Not just a restoration of existing space, the association faced the challenge of finding additional square footage to comply with new mechanical and code requirements as well as for administration and management areas. Susan Sperber, Executive Director of the Colonial Theatre, opened the meeting and introduced Colonial Theatre Board President Howell Palmer and Building Committee Co-chair Michael MacDonald, who outlined the extensive process they engaged in to select architecture firm Martinez & Johnson of Washington, D.C.
MacDonald stated that the project was approached with three optionsadd the extra square footage directly to the existing theater structure, link the theater via an addition to a former U-Haul space behind the theater, or acquire a former car dealership, now a warehouse, to the north of the theater to create openings between the two structures. After discovering that the former car dealership has historic building status, which qualified the project for additional tax credits, the third option was chosen. The warehouse space is an open beam structure that will add over 13,000 additional square feet of easily configured space, and the new architectural plans locate all administrative offices, dressing rooms, and set storage there. Martinez & Johnson Architecture was attractive for many reasons, primarily their experience in the restoration and reconfiguration of historic theaters around the country. The firm’s most notable regional project is the restoration of the beaux-artes-era Boston Opera House. The landmark was in a much worse state of repair than the Colonial Theatre and it required approximately $40 million to upgrade and restore, down to ornate plaster encrustations and actual gold leaf details. The Colonial Theatre Association has so far amassed approximately $11 million of the $16 million currently estimated for the project. And the eleven million was recently bolstered by a City of Pittsfield $1 million disbursement of economic redevelopment funds from General Electric. In addition to raising money for the completion of the renovation, the association is also seeking an unknown amount of funding with the aim of attracting and outfitting a production company to take residence at the theater. At the meeting, principal architect Tom Johnson unveiled a three-dimensional model of the site in conjunction with a presentation of the firm’s experience and an outline of the design to be applied to the Colonial Theatre. What makes this project easier to execute is the existence of the original architectural drawings, schematics, historical photographs, and published descriptions and newspaper anecdotes of the theater and productions that occurred there. These facts and details will help the architects to match colors and fabrics, and restore trim and plasterwork. According to Johnson, the operating theme behind his firm’s approach to the Colonial project is “historic preservation balanced with updated theater design.” After describing some specific improvements, as well as an overview of the construction phases, Johnson turned the meeting back over to the Colonial Theatre Association board members in order to conclude and answer questions from the public. A few questions touched upon some controversial issues surrounding the theater. 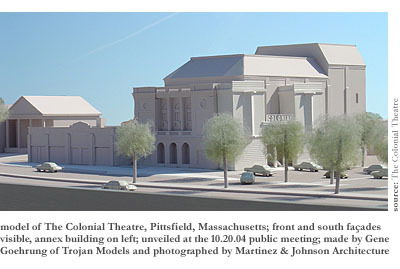 When Executive Director Susan Sperber was asked if Pittsfield’s visitors center, newly constructed for tens of thousands of dollars and located immediately to the south of the theater, was going to be demolished (as clearly evident in the 3-D model), she stated that the visitors center “would be relocated to the Colonial Theatre’s annex space,” somewhat diplomatically avoiding the issue of the vast amount of money and resources that Pittsfield has put at the disposal of the theater. Responding to a question about where the 900+ patrons would park, Sperber replied that “according to a recent traffic study, there is adequate parking within two and a half blocks of the theater.” This, of course, is assuming that no other events in the downtown area are occurring at the same time and that there will be minimal residential on-street parking. This combination of circumstances seems unlikely as the Crowne Plaza Hotel, Berkshire Museum, Berkshire Music School, and other venues are within the described two and a half block radius and have regular events, frequently experiencing parking shortages. Construction bidding will begin soon for the Colonial Theatre. With an opening set for the second quarter of 2006 and another $5 million in funds needed, the project will have to kick into high-gear to attain its goals. While the 20 or so people at this public meeting were interested in the project, it was hardly an example of the outpouring public support members of city government, including Mayor James Ruberto, and the Colonial Theatre Association have said they have received and claim they will need in order to open the theater. One of the local newspapers, The Berkshire Eagle, has also projected an aura of massive corporate and public support for the project, which hardly seems apparent thus far. As the clock ticks down during the next 20 months, will this story change, or as the work becomes more visible will the public support follow? Time will tell.